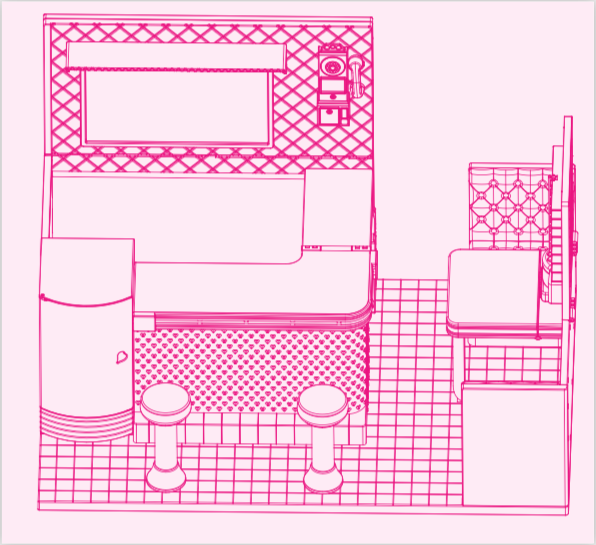 Order up some fun and adventure in this restaurant for 18-inch dolls! One strawberry milkshake! Comin’ right up! 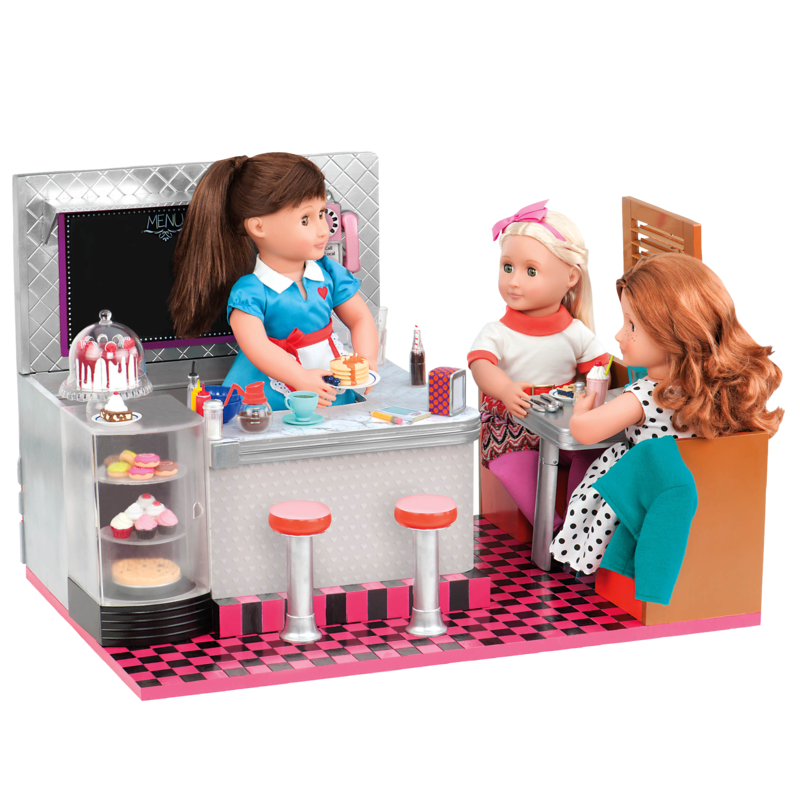 Your dolls will get their fill of sweet retro fun at the Our Generation Bite to Eat Retro Diner! 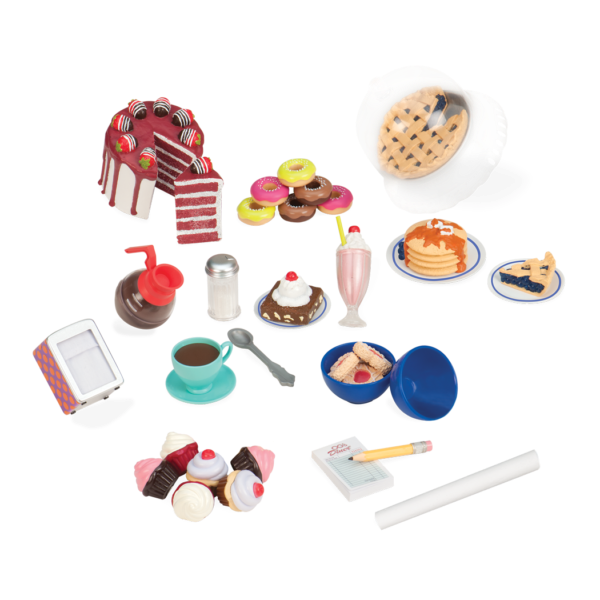 This fully-stocked restaurant playset for 18-inch dolls is packed with accessories and all the ingredients for making charming memories. Bop to the beat on the jukebox, daddy-o! 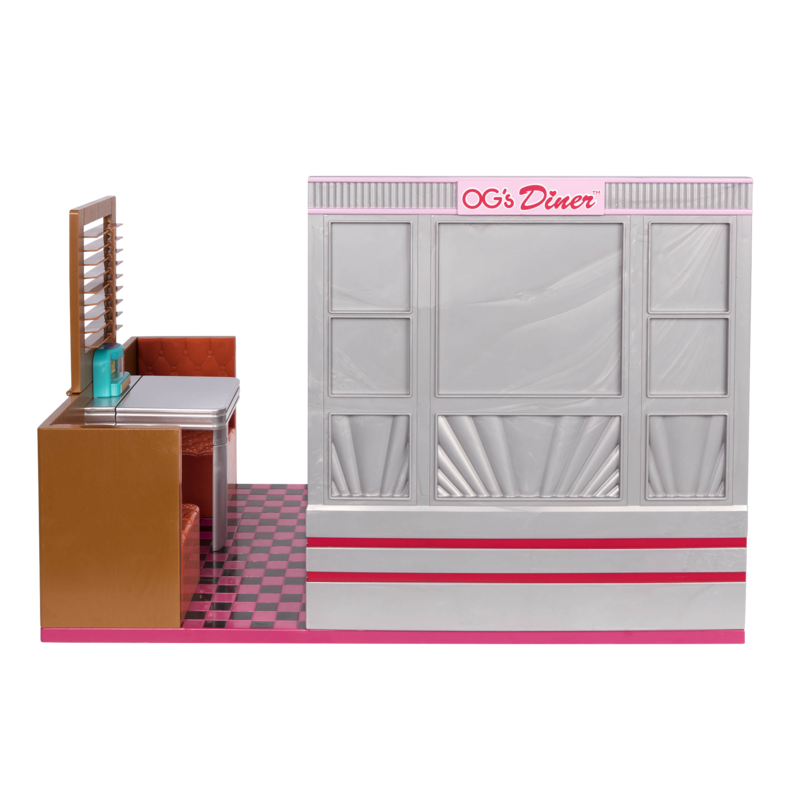 This diner playset features a retro-style serving counter where staff can prepare your order. Which doll will be the customer and the server today? Advertise your daily specials with the real chalk and chalkboard, and entice your customer’s sweet tooth with a display case full of scrumptious desserts – it really spins! 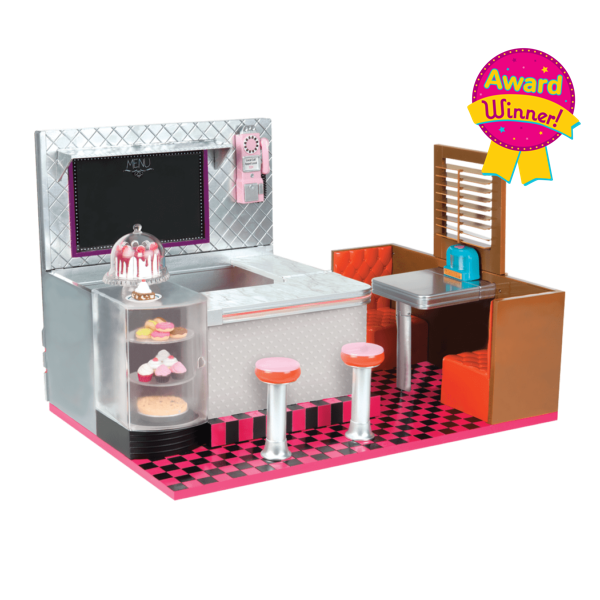 Customers can sit at the counter on the movable vinyl and chrome-colored stools, or in the booth. Open the shutters to let in more light, and treat your dolls to a tune on the working jukebox! 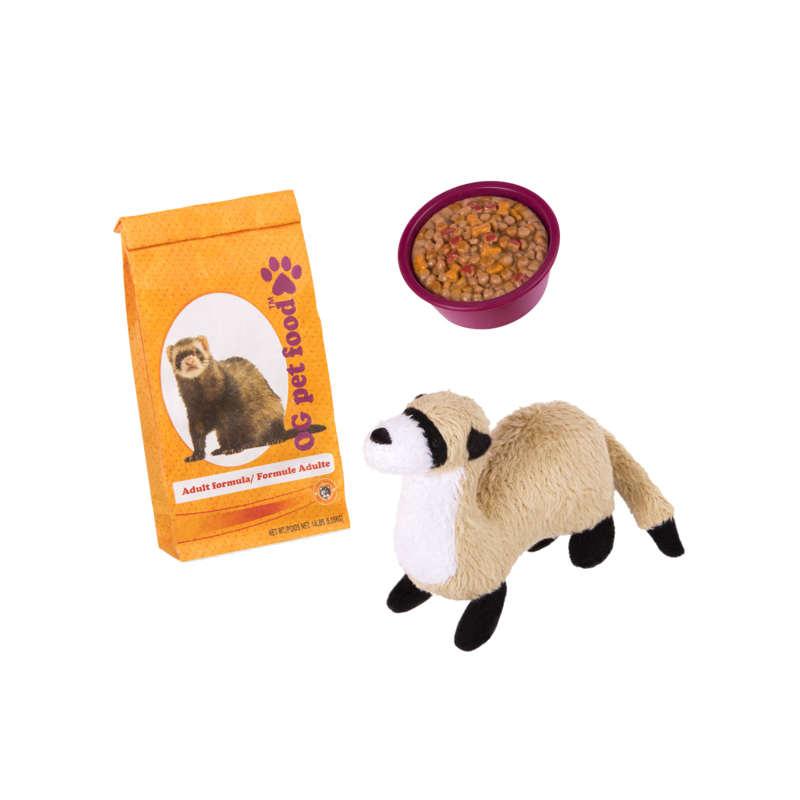 Over 70 pieces of realistic pretend food, dishes, and other accessories will put hours of fun on the menu! 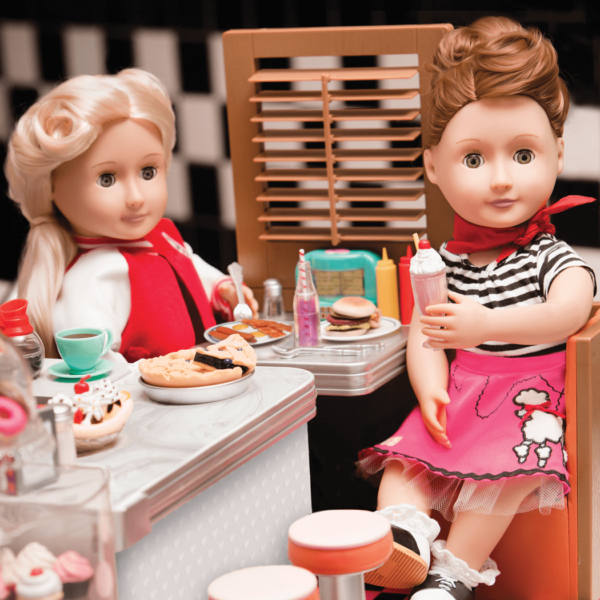 Have you met Reese and Ginger, the dolls in the photo of the Bite to Eat Retro Diner? These cool cats just love playing in the diner, and also come with their own storybooks so you can follow along with their adventures! 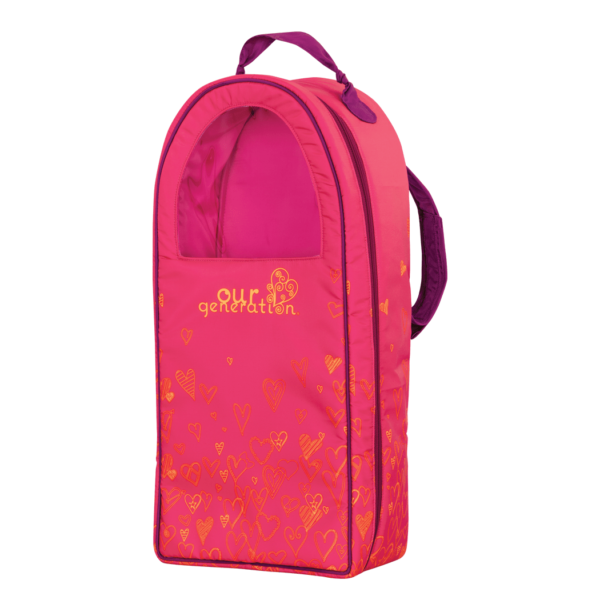 Any Our Generation doll will look great in one of the nifty Retro Outfits! In the pictures, Reese is wearing the Soda Pop Sweetheart retro waitress uniform, and Ginger is wearing the groovy Neat-O Knit outfit featuring a cool retro-style knit dress! Features working jukebox, real chalkboard, spinning display case, and more! 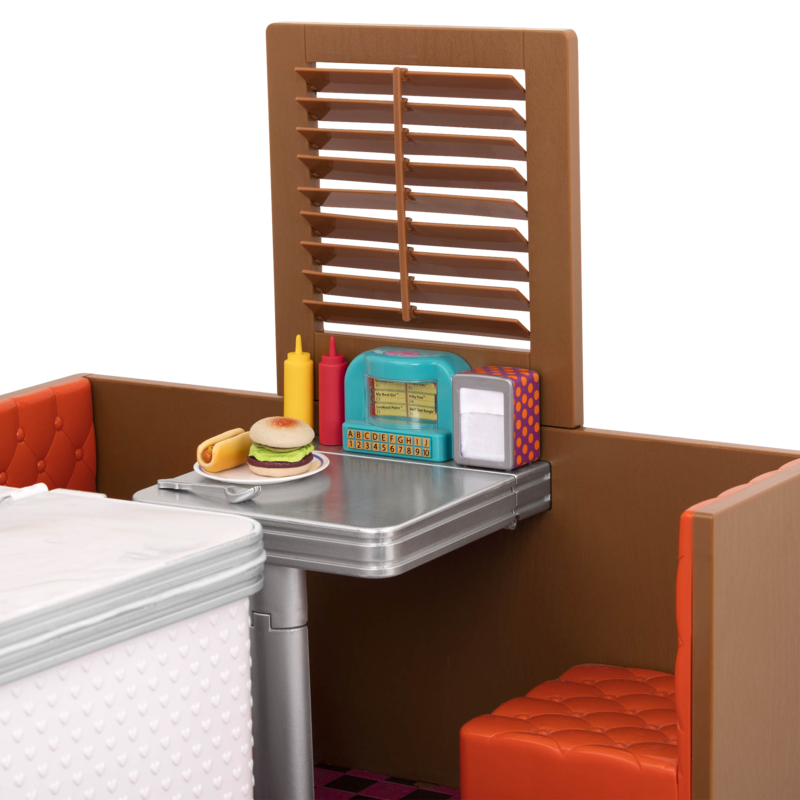 The Bite to Eat Retro Diner arrives partially assembled, and requires just a little bit of help from an adult to give it the finishing touches. 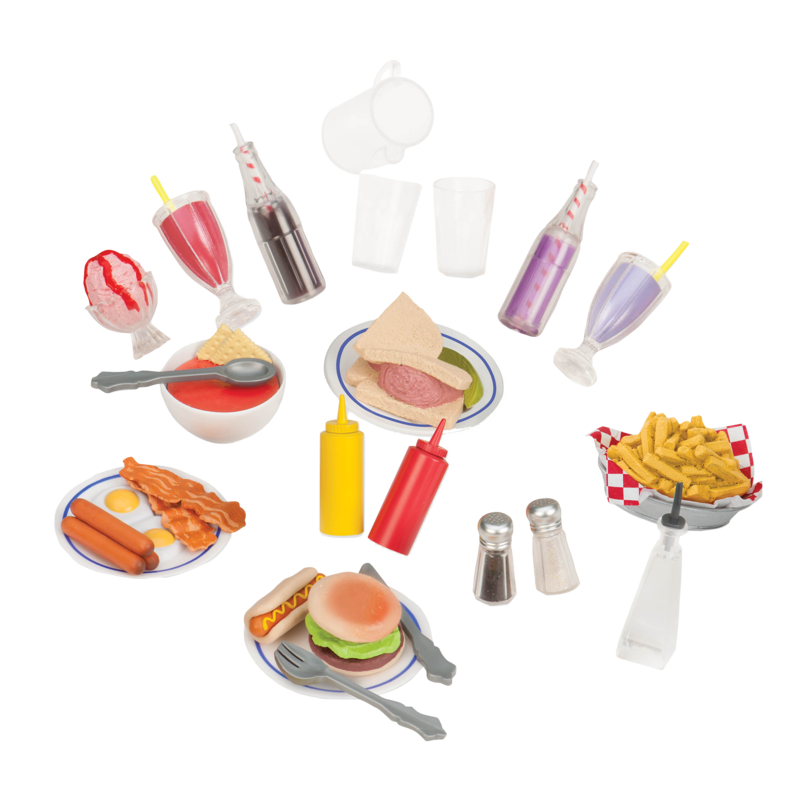 To make the most of your Bite to Eat Retro Diner playset for 18-inch dolls, it is very important to assemble it carefully. Assembly requires 1 x Philips screw driver and adult assistance. Follow the directions on the instruction sheet carefully, and remember to avoid forcing plastic components into place in order to avoid breakage. If you need extra help (everyone does sometimes! 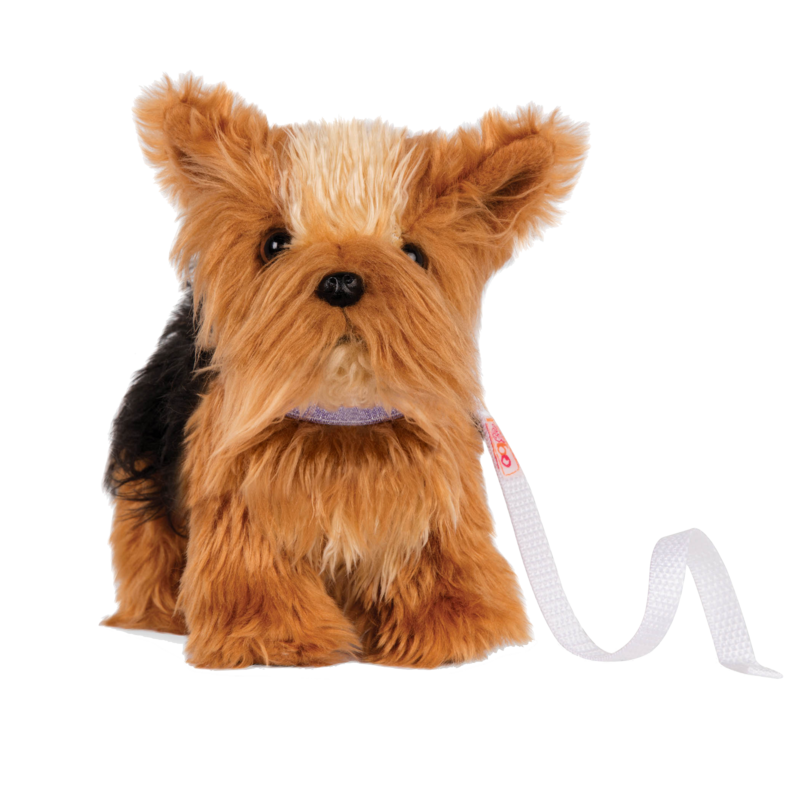 ), reach out to our Customer Service Team at Battathelp.com and we will be happy to assist you!